Forget hands on. Think feet and bellies. When taking a tour of the aquaculture shellfish farm behind the Matunuck Oyster Bar restaurant in South Kingstown, R.I., you not only learn about where your food comes from, you walk through its breeding grounds, and if you’re lucky, harvest a few oysters to eat later. Sometimes the nibbling is sooner. 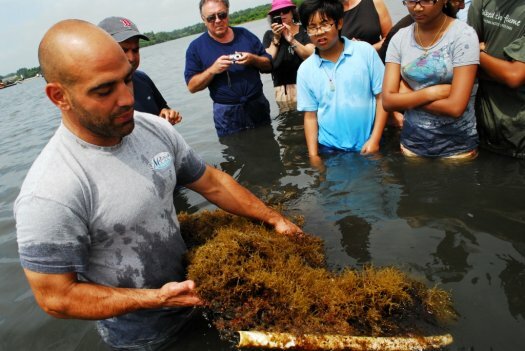 On a tour last summer, led by owner of the shellfish farm and restaurant, Perry Raso,who does them once a month, showed us where he also grows gracilaria, a tannish, tasty seaweed served in his year-round eatery. This day, with a dozen or so other adventurous customers who slogged to the aquaculture site in nearby saltwater Potter Pond, Raso raised a netted container used to grow the seaweed, and bid us all to have a bite. Some did, some didn’t. 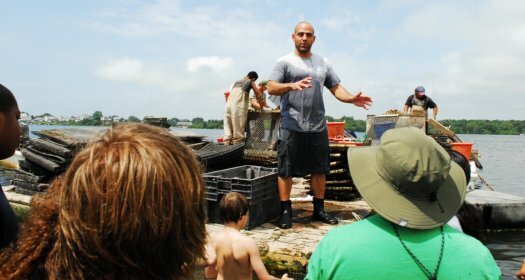 Personally, I couldn’t get enough of the crunchy, salty seaweed, munching it down as Raso, as impassioned about the environment as he is his restaurant business, explained how shellfish farming works, in the middle of the pond where he cultivates some 16 million oysters in the deliciously briny water.. The tour started on the restaurant patio where participants gathered to listen to Raso talk about the ecological importance of estuaries and barrier beaches, the different taste of various Rhode Island oysters and how those harvested in fall tend to be sweeter, since they produce more glycogen when the temperature drops. 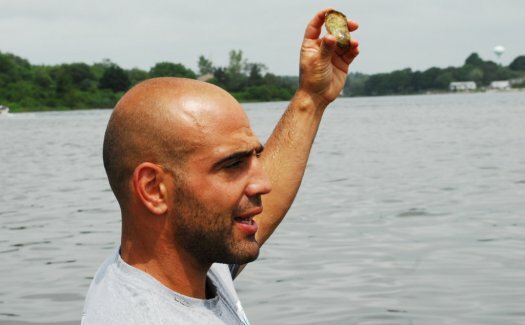 Raso, 33, a short, muscular former collegiate wrestler who started his aquaculture business in 2002, talked quietly but intently about the environment, using charts, photographs, oysters and his passion to drive his points home. 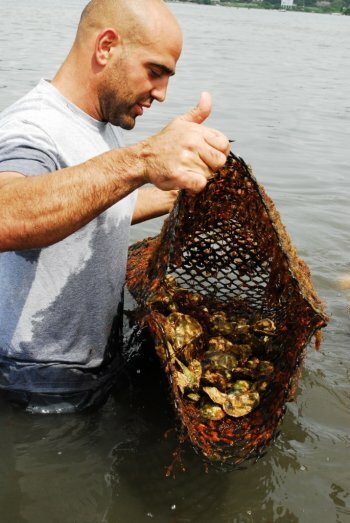 He uses about 30 percent of what he grows in Potter Pond at his restaurant, and also sells to retailers, in addition to buying oysters from various other aquaculture businesses in the state. There are about 35 in Rhode Island, he said. After about a half hour of technical talk, the group walked down Succotash Road and through occasionally hip-high water to Raso’s farming site, about a 15-minute jaunt, Raso stopping along the way to explain various landmarks before getting to his farm buried beneath the water. There was a barge in the middle, where workers sorted grown oysters into bags. 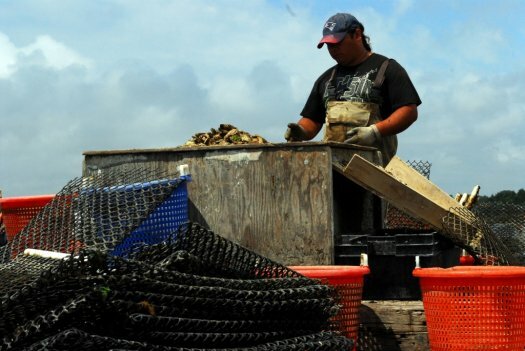 All around us, Raso explained, were 10,000 heavy-plastic mesh bags, where tiny oysters he buys from hatcheries are placed, with two liters swelling into 30 liters when fully grown in two to three years, the process involving moving the growing shellfish to other bags. As we walked, he advised us to follow him closely on the path he knows well, so as not to trip over the bags at our feet, which a few of us did anyway despite his warning. 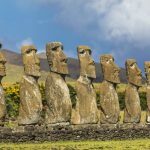 As he talked, a few of us dug into the muck with our toes, finding a random oyster here and there, pocketing them and taking them back to the restaurant to eat later, a common practice with tour takers, Raso said. What you find growing outside the bags, you can have, he said, and restaurant workers will shuck them for you. This day, I found about five fat ones, but three turned out to be duds, dead oysters filled with mud. Such are the chances you take in the watery wild. The entire tour, which lasts roughly an hour and a half, depending on how many questions Raso is peppered with, ends back at the restaurant, where most usually opt to have lunch, chowing down on what they found or from the rest of the expansive seafood menu, either inside or the large patio outside on a breachway leading to the pond. Inside is a handsomely carved, three-sided wood raw bar, where workers on busy days are in constant shucking motion, a depiction of Narragansett Bay carved into it, spots marked where various oysters are harvested, the front etched with “Where the Oysters Are.” Even in summer, air conditioning is seldom used, a constant sea breeze coming through open windows. 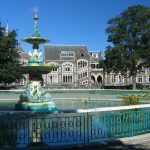 The tour is held year round, and when the weather turns colder, guests are provided with heavy waders. If it’s too cold, but enough express interest in going anyway, they can be shuttled to the site by boat, Raso said. Raso, a native New Yorker, came to Rhode Island as a boy, when his dad, a retired police officer, decided to move here and try life as a fisherman, later becoming a local cop. But Raso had the farming bug by then, an eager 12-year-old boy diving and digging for clams to sell. 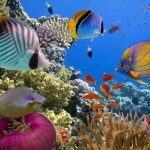 He found out, attending college in Connecticut and Colorado, and ending up at the University of Rhode Island for a bachelor’s degree in aquaculture and life sciences. He started shellfish farming in 2002 and in July 2009, opened his restaurant at the site of a place that had been many others over the years. The business took off and has been one of the busiest in the area. 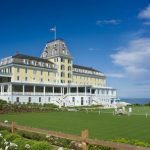 Earlier this year, Raso won the Tourism Works for Rhode Island Award from the South County Tourism Council. 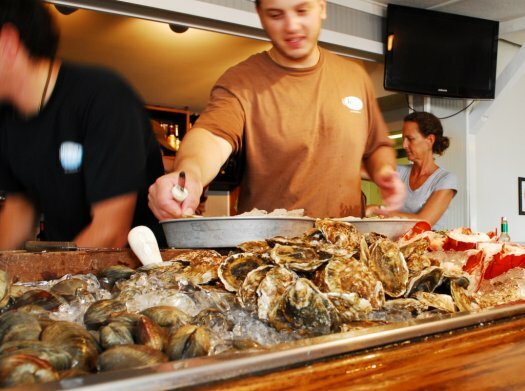 Maria Vidas and Bernie Langer, college professors from New Jersey and oyster lovers, have taken their summer vacation in the area for a few years, after a friend told them about how good Rhode Island oysters were. They discovered Matunuck Oyster Bar, coming daily for lunch, they said one day when they were about to take their first tour.